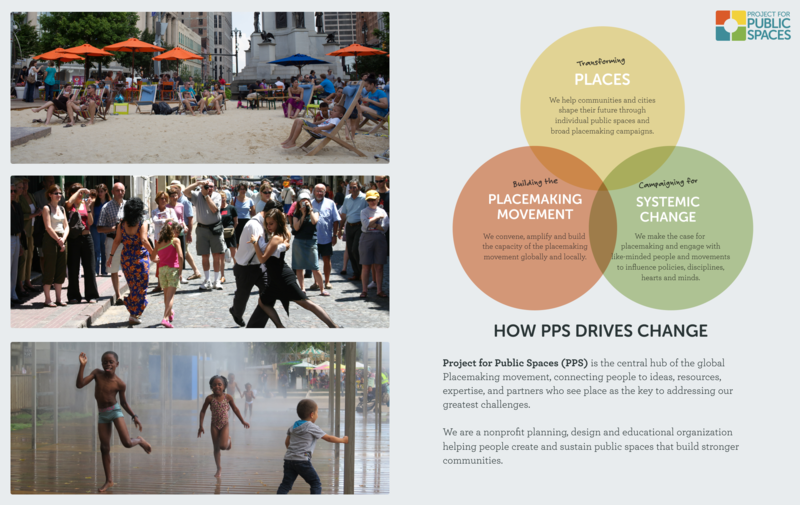 PPS was founded in 1975 with a simple three-year mission: demonstrate why public space matters. 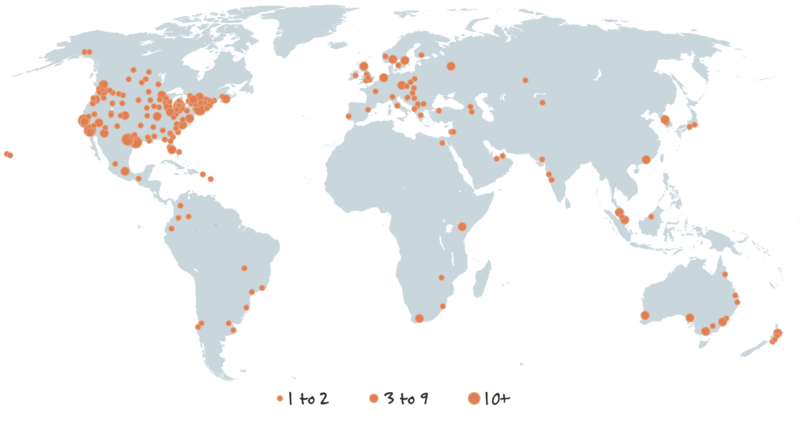 But instead of hanging up our hats in 1978, Project for Public Spaces has grown and grown, touching more than 3,000 communities in 47 countries over our 40-year history. Today, placemaking, our approach to the community-driven improvement of public spaces, has expanded far beyond our walls, turning into a global movement. From Peru to Malaysia, from Kenya to Israel, our mission at PPS is no longer ours alone. Download the full version of "How PPS Drives Change" here! In line with this movement, PPS’s strategy has continued to evolve, too. Today, PPS not only helps communities improve their public spaces firsthand; we also work to change policies and support the people that make great public spaces possible, both on a citywide and worldwide scale. Every PPS project integrates layers of training, culture change, and storytelling that extend beyond a single public space or community. Meanwhile, our international networks, campaigns, and programs always incorporate aspects of on-the-ground work with real places and people. This is what sets PPS apart: In everything we do, at every scale, we connect the dots between doing, learning, and changing systems. Our projects and trainings have reached more than 3,000 communities since 1975. Just as a park is more than its benches and open spaces, placemaking is never just a project or its result. Since PPS’s early days working around New York City on public spaces like Rockefeller Center and Bryant Park, our placemaking projects have been part of something bigger. The collective capacity that communities build through the process of improving a public space is just as important as the place itself. These hyper-local projects, beginning with Lighter Quicker Cheaper improvements, have often been the catalysts for broader campaigns that engage entire cities, states, or even countries. Take Detroit, for example, where projects at Eastern Market, Peaches and Greens, and Campus Martius have become the epicenters of what was first a citywide campaign, and eventually became a state-wide movement to rebuild its economy and create more equitable communities. PPS is looking for ambitious clients to collaboratively kickstart powerful city-wide campaigns that address broader systemic challenges like policy change, government reform, and pressing issues like housing equity and health. It takes a community to build a movement. Thankfully, PPS is no longer alone in its vision of great public spaces. From our early days of time-lapse videos and activity mapping in New York City’s public spaces, our research and resources have empowered people to take action in their own communities. Over the years, this group of placemaking early adopters has matured into a global network with a life of its own. 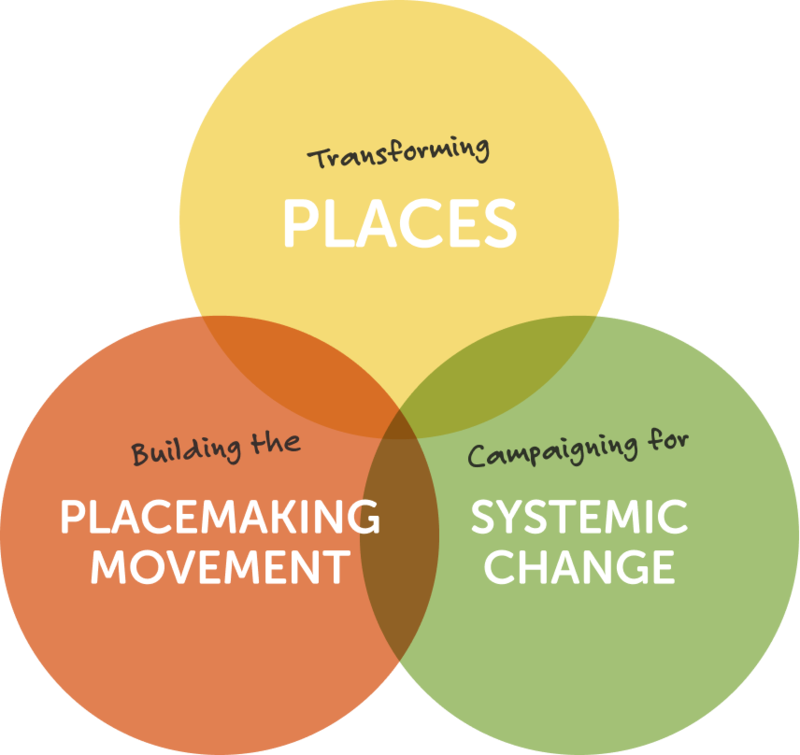 PPS continues its commitment to this network through the Placemaking Leadership Council (PLC), which brings together public space thinkers and doers to define the future of the placemaking movement. With more than 1,800 members, this growing community is a veritable gold mine of placemaking stories and resources. Events like our International Public Markets Conferences, Walk/Bike/Places (scheduled to take place in New Orleans this year), and our continued trainings and workshops have reached a global audience, while PPS’s two global Placemaking Week conferences have already inspired local offshoot events in Europe, Australia, Latin America, and Africa. PPS has always been comprised of change-makers. In the New York City Streets Renaissance campaign, PPS shook up the way the Department of Transportation designs city streets and intersections, with lasting benefits to pedestrians and cyclists. PPS also helped placemaking to make the jump into academia, with the establishment of Pratt Institute’s Urban Placemaking and Management Program based on PLC members’ ideas for a placemaking curriculum. 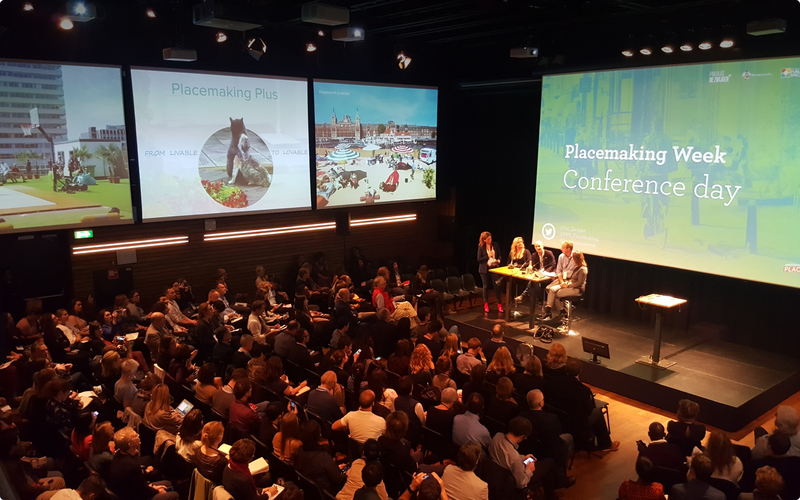 Bridging local and global efforts, PPS and the Ax:Son Johnson foundation made the case for public space and placemaking in the New Urban Agenda, an international agreement adopted in 2016 by 167 countries to guide sustainable urban development globally over the next 20 years. But we’re nowhere near finished. There are big, systemic challenges facing communities around the world, from climate change to displacement, and our next step will be to scale up our campaigns and connect with like-minded causes, from the public health sector to climate change activists. There is no shortage of opportunities for placemaking to continue to spark change all over the world, and we are proud to continue working at the intersection of the practice, people, and paradigms that shape the public realm. 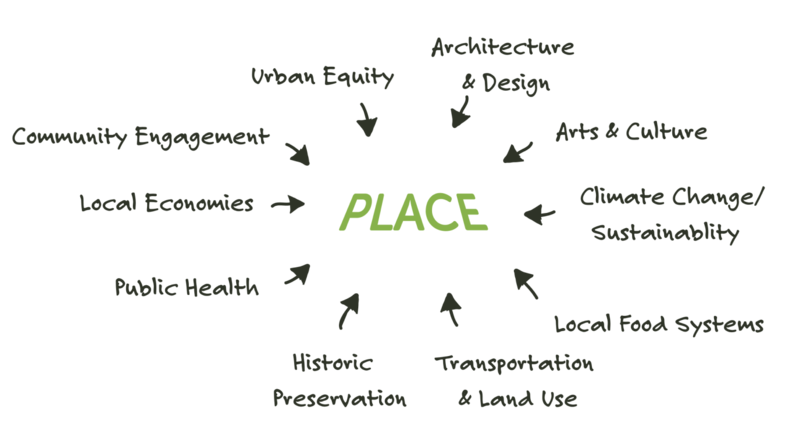 Apply to join the Placemaking Leadership Council, and join a network of passionate advocates for place! Work with us on a public space project, training, or campaign! Get the latest placemaking news by subscribing to our newsletter!